Designed with modern living in mind, open plan kitchen diners are amongst the most sought after features of a contemporary home, thanks to their light, spacious and versatile design. Whether you're factoring an open plan kitchen diner into a home renovation, want to rework the layout of a period property for modern life or are looking for ideas to refresh an existing, but tired looking, kitchen diner, our modern open plan kitchen diner design ideas intend to help you create a space that's as perfect for family life as it is for entertaining guests. We'd recommend using this design guide along with our comprehensive guide to how to design an open plan kitchen. You'll find plenty more inspiration in our traditional open plan room design ideas, too, if that's more your style. If your taste is for an open plan kitchen diner with an ultra-modern feel, you might consider opting for a monochrome scheme that makes the most of straightforward silhouettes and modern materials, such as resin or concrete flooring. Browse more of our ultra modern kitchen design ideas if you like the idea of a high-spec, contemporary kitchen diner. Our guide to how to choose the best resin or concrete flooring might be of interest, too, if you do opt for this look. For those designing a modern open plan kitchen diner, it's often the prospect of a space flooded with natural light that appeals the most. The use of skylights, roof lights, clerestory and glazed doors is the easiest way to flood a space with natural light, though it's worth considering suitable window treatments if your kitchen diner is south facing and you want to prevent it feeling like a greenhouse during the warmer months. Browse our kitchen window treatment ideas for stylish, yet practical, solutions. While 'open plan' often conjures up images of large, airy kitchens, it is possible to achieve similar outcomes in a smaller space by applying slightly adapted design tricks. As mentioned, you'll want to make the most of natural light and might also consider opting for a light scheme in order to make your kitchen feel as spacious as possible. In terms of incorporating the dining aspect, it's best to opt for a table in a similar shade and finish to your kitchen cabinets, which will help it blend into the scheme effectively. Alternatively, round tables or glass tables are go-to options for smaller kitchen-diners. For more design tips, we'd recommend making use of our guide to how to design a small kitchen. Our beautiful small kitchen ideas provide plenty of inspiration, too. Despite everything we've said about using light shades for a bright and spacious open plan kitchen diner, you shouldn't write off the dark and atmospheric interiors trend altogether. Designed as part of a scheme with plenty of natural light, darker, moodier shades can make a stylish addition to an open plan kitchen diner and is an on-trend option at the moment. Tempted? Browse our dark and dramatic kitchen design ideas for more inspiration. 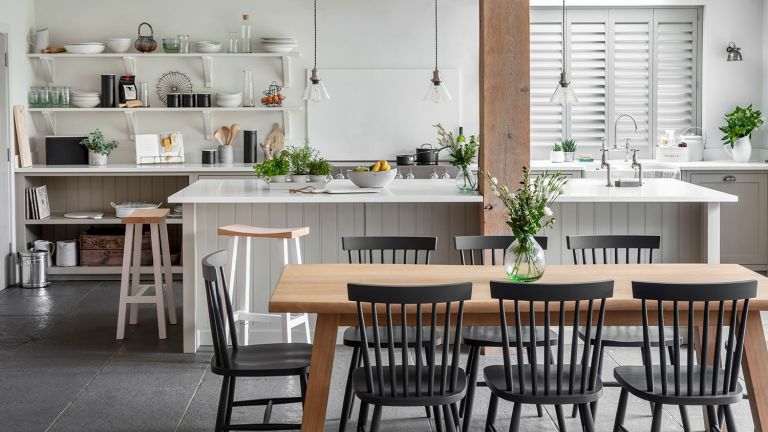 For an open plan kitchen diner with a laid back, or unfitted, family feel, you might consider turning to Scandi-inspired spaces for inspiration. Incorporating features such as open shelving or freestanding kitchen units and intentionally mis-matching materials is an easy way to make a space feel lived in, without compromising on style. If you like the sound of a kitchen diner with a relaxed feel, take a look at more of our flexible freestanding kitchen ideas. A popular addition to contemporary open plan kitchen diners – and in particular those designed as part of a larger kitchen extension – bi-fold doors make for a stylish design feature that draws the eye, effectively creating flow between the kitchen and the outdoors. While bi-fold or sliding doors tend to be more expensive additions, they're worth the investment if you have budget to spare and what to add a standout feature to your dream kitchen diner. Use our guide to how to choose the right bi-fold and sliding doors for your home if you're considering either as an option. For more of an idea of how they might work as part of your kitchen diner, take a look at our bi-fold and sliding door design ideas. If you love the idea of bi-fold or sliding doors to flood your kitchen diner with light and give it a distinctly contemporary feel, but don't have the budget to invest in such a standout feature, it's worth considering floor-to-ceiling metal windows and doors as an alternative. They're equally stylish, have the same effect light-wise and, while not to be considered cheap, make a much more affordable alternative. Use our buyer's guide to metal doors and windows for more practical advice and information. If you're working a modern open plan kitchen diner into a period property, you might consider opting for a colour scheme that complements the history or character of your space – our guide to how to choose paint to decorate a period home will point you in the right direction. Bear in mind that this hint at a properties history can be subtle, allowing for a scheme and space that's, in every other respect, modern. Positioning pendant lighting above a kitchen island is an easy design technique that can be used to create a striking (or understated) focal point within an open plan kitchen diner and can be effective in helping to zone a space. Use our guide to styling and zoning a large room if you're looking for tips on how to define different sections of your open plan scheme effectively. We've got practical tips on how to create good flow in your open plan layout, too. If you plan on using your open plan kitchen diner as a location for socialising and entertaining guests, it's worth considering incorporating a kitchen island into your scheme. Teamed with stylish bar stools, they're the perfect set-up for chatting with friends while you cook dinner or enjoying a laid back breakfast on a Sunday morning. Find more inspiration in our kitchen island design ideas. Prepare your dream set-up using our kitchen island seating ideas, too. Similarly to small homes, it's possible to implement an open plan scheme to create a spacious-feeling kitchen diner in a flat. It's worth minimising the number of kitchen cabinets to what's absolutely necessary and opting for slimline appliances in order to maximise space. Open shelving will prevent the space from feeling boxy and can make an attractive addition if styled with only the prettiest of accessories. Our pick of the best slimline dishwashers is a great starting point. Incorporating colour and texture into an open plan kitchen diner is an easy way to add interest and create a space that feels a little more unique. We love this use of rattan bar stools and lighting to add texture and a subtle boho vibe, as well as bold yellow chairs which complement the use of a stand-out blue kitchen island. If you want to create some consistency in your open plan kitchen diner, you'll need to choose furniture that's similar in style and finish, but not too matchy. This might be achieved by opting for furniture in similar wood finishes – in this kitchen diner the bar stools and dining table complement one another – or through the use of an accent shade incorporated subtly throughout a space. Exposed bricks walls make for a statement addition to a kitchen diner, creating a distinctly industrial feel when paired with darker, more atmospheric shades. Renovating a period property? Exposed brick can be used to hint at the history of a space while still working as part of a more contemporary interiors scheme. Use our guide to creating a feature wall with exposed bricks for more expert advice and information. An open plan kitchen diner, if designed effectively, can have all the functions of a contemporary space without sacrificing its rustic appeal. The trick is designing the space with a muted or neutral colour palette and opting for furniture with more traditional appeal – we're thinking a Shaker style kitchen design and country-style dining tables – you'll find plenty in our guide to the best traditional dining tables. Looking for more advice and inspiration for an open plan home?